O, Christmas Tree…O, Christmas Tree…. First off, you should know that Christmas is my most favorite time of the year! Not only was it the birth of yours truly, but it was also my time to pick out the biggest, most beautiful Christmas tree ever….ok, well I grew up being able to pick out my own tree. The birthday tree! (BTW—for the longest time I really did believe that everyone got to pick out a tree on their birthday.) Later on, I realized this not to be so. A little disappointing really….kinda like finding out there is no Santa. So, I LOVE picking out Christmas Trees! Last year we had the MOST.FUN.EVER cutting down our very own Christmas tree! We brewed up some amazing makers mark cider, layered on lots of clothes, and headed out with friends to chop down our very own tree. It was so much fun. We picked the PHATest tree ever…it was awesome! I loved it. Now that we live in AZ—I was hoping we would be able to do this again. You know, head up North, find the perfect tree…etc. Well, first I was laughed at and then I was told you have to have a permit in AZ. Not to have my dreams dissolve rapidly by Scrooge, I went online to verify….tis true, and you had to have a permit filed way back in May or so. 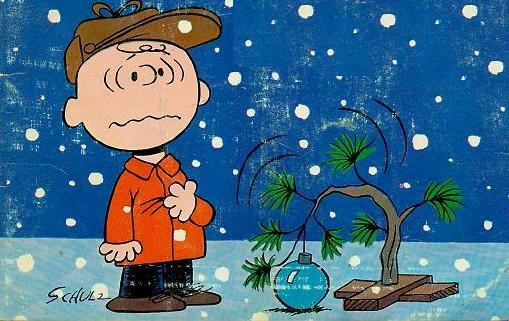 Hence, my dreams of sugar plum fairies dancing, Maker Mark Cider and Dr. Seuss Trees were catapulted out of my head and in came: Charlie Brown Christmas Tree…..is this what it has come to? Say it ain’t so…. How disappointing! Bummer! Maybe next year? Very disappointing!! Maybe next year!